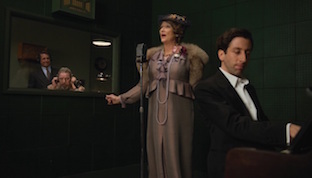 Let's get this out of the way right up front: Meryl Streep's singing as Florence Foster Jenkins is painfully bad. Yes, I know that it's supposed to be bad. This is not a negative comment on Streep's considerable talents, but a kind of public service announcement: some people -- and you probably know if you are one -- risk actual disorienting pain from the off-key caterwauling. Regardless of the movie's quality, forewarned is forearmed. Florence Foster Jenkins is the second version of the socialite's story we've seen this year, after March's release of the Franco-Belgo-Czech Marguerite. Where that film took an artier, more impressionistic approach to its adaptation, this one is thoroughly geared towards mainstream Anglophone tastes. Which one you'll prefer is largely dependent on the direction your own tastes run, but I want to assure the arty audience that Florence Foster Jenkins is not as insufferably smarmy as the worst of its "inspirational" marketing might suggest. To be sure, it can be as spectacularly unsubtle as Jenkins voice. 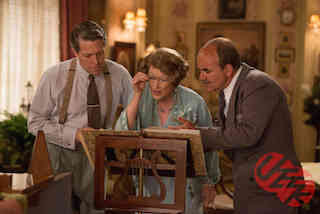 Where Marguerite discarded literal biographical details in favor of a meditation on the interplay between fortune and image, Florence Foster Jenkins treats the details of her life as a checklist. Common-law marriage to failed thespian St. Clair Bayfield (Hugh Grant): check; accompanist Cosmé McMoon (Simon Helberg): check; the unfortunate fallout from Jenkins' first marriage: check. The movie opens on a collection of Jenkins' tableaux vivants, and sprinkles tidbits such as a childhood piano recital at the White House generously into Jenkins' exposition to the other characters around her. Nicholas Martin's script does round off some of the corners, though never all that unforgivably. McMoon worked with Jenkins for almost twenty years in reality, for example. Though Bayfield did formally marry Kathleen Weatherley (Rebecca Ferguson) shortly after Jenkins' death, there's little concrete evidence that they'd carried on an affair before it. And Jenkins' piano career was cut short by damage to her left arm, it was caused by an injury rather than as another consequence of her first marriage. That last change seems to be a gesture towards a theme, something along the lines of a Gatsbyish attempt to recover regretfully lost chances. Unfortunately, the script never really follows up on it. Streep, to her credit, makes good use of it in her character work. Similarly, Bayfield's affair points to a certain tension: is his relationship with Jenkins innocently affectionate, or is he something of a leech? Does he jump through hoops keeping the truth about her voice under wraps out of a desire to spare her feelings, or is he just trying to keep the gravy train running? A better film -- like many director Stephen Frears has made before -- could engage thoughtfully with this question, but it would have to go to a darker place than this opera buffa is willing. In fact, for a moment early on I thought that Florence Foster Jenkins was going to turn into exactly that movie. At McMoon's audition, Jenkins requests he play something light and inoffensive, and not terribly loud. He chooses "Le cygne", while the other pianists outside the door snark about "some Saint-Saëns [crap]". And indeed, the piece would have been taken by serious musicians as hopelessly outdated and smarmy pablum, but it's exactly what Jenkins wants to hear as it recalls some fond childhood memory. This is another fudge, by the way; it was actually released around the time of her first marriage and the end of her piano career, so changing this misses the opportunity to capitalize on another nascent theme I mentioned earlier. But it made me think, has this man sussed out what the others haven't? Is he obsequiously feeding her what he knows she wants, knowing on which side his bread will be copiously buttered? Is the film, dare I hope, self-consciously setting up a coded reflection of the way the movie it seems to be treats its middlebrow target audience? No, of course that's too much to hope for. Everything is exactly as it appears. McMoon is no conniver playing on a mincing variation of an aw-shucks San Antonio hayseed image. He really is as guileless as he appears, and it honestly takes him a while to pick up on Bayfield's deadpan, arched-eyebrow irony. And Bayfield, for his part, really does harbor a genuine affection for Jenkins, and the script never gives any serious reason to doubt it. Florence Foster Jenkins is light and inoffensive, even though Jenkins' terrible voice is often terribly loud. I'd normally be smirking on the other side of the door. But I've already had my version of this story this year. Here's one for Florence and her friends in the Verdi Club. Who am I to deny them their pleasures?